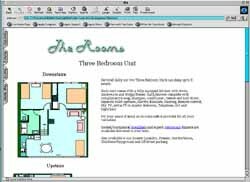 Macromedia Dreamweaver is a program designed to generate webpages. It was primarily to design static site. It is recognised as the leading tool for webdesign. Green Gables Motel is a Lower Hutt based motel. The client wished to have an information site, that also contained a booking form, that they could use to expand the information they used in other print advertisements. We built a simple 10 page site entirely in Macromedia Dreamweaver, and linked it to an online form for the reservations.